A new generic Stand Trigger for Angel Feather appears. ACT [Damage Zone]: [Flip this card face-down] Choose 1 of your Units, during that turn, it gains Power+3000. • Special artwork cards drawn for this product: “Mikazuki Munechika -Hanamaru-” and “Ichigo Hitofuri -Hanamaru-” from the “Touken Ranbu -Hanamaru- Deck Sets 1 & 2” (on sale October 6th, 2017). 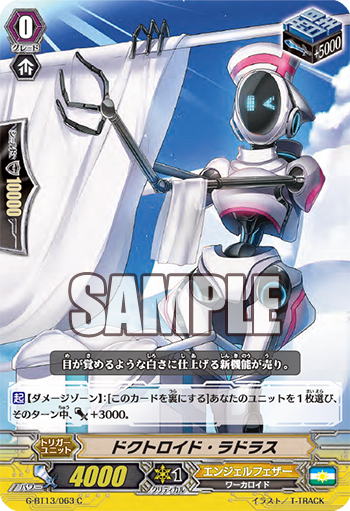 • The 《Angel Feather》 “Doctoroid Ladrus” from the 13th Booster Pack “Ultimate Stride” (on sale November 17th, 2017). Tomorrow, the “Touken Ranbu -Hanamaru- Deck Set” finally goes on sale! This item contains cards that use artwork from the anime. “Mikazuki Munechika -Hanamaru-” and “Ichigo Hitofuri -Hanamaru-” both have special artworks drawn by the animaton studio. Use this oppurtunity to get these cards! Both are powerful cards that you can use to immediately buff your Deck. Also, the Stand Trigger, “Doctoroid Ladrus” is a Unit with a Skill that activates in the Damage Zone. By flipping itself face-down, 1 ally Unit gains Power+3000. Stand Triggers are compatible with the 【Rescue】 ability that’s the clan speciality of 《Angel Feather》, so this is a card you’ll want to include at least one copy of in your 【Rescue】 Deck. Let’s raise the pressure of 【Rescue】 with this card! We’ll be introducing cards from the 13th Booster Pack, “Ultimate Stride” will be introduced in future “Today’s Cards”! Please look forward to it!